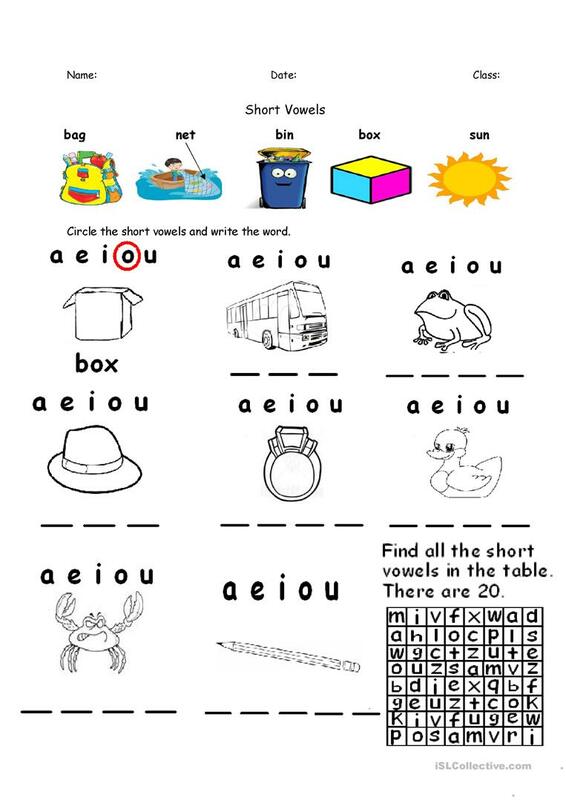 Read the words and point to the pictures emphasizing the vowels sounds a/e/i/u/o. The children look at the picture box. Say the word box ask the children to listen out or the /o/ sound. Point out that in the line of short vowels above the picture the /o/ has been circled. The children look at the rest of the pictures and say the words for them circling the short vowel above. Also write down the words under neath the pictures. The last picture has 2 vowel sounds see if your children can pick them up! Finally a word search containing 4 of each vowel sound to find. Fully editable, hope you like it! The present downloadable printable was created for elementary school students, kindergartners and nursery school students and adults at Beginner (pre-A1) and Elementary (A1) level. It is valuable for revising Consonants and vowels and Phonetics (pronunciation, IPA, phonetic symbols) in English, and can be used for enhancing your groups' Spelling skills. jwmk88 is from/lives in Hong Kong and has been a member of iSLCollective since 2012-03-12 05:26:15. jwmk88 last logged in on 2014-12-12 12:29:21, and has shared 2 resources on iSLCollective so far.